Several years ago I took a professional development course on (not taught by) Debbie Diller's Literacy Work Stations for Grades 3-6. The class was excellent because it was "make and take" and by the end of the class we all had several work station materials ready to use in the classroom. Our homework during the course was to make and present our own workstation to the rest of the class. At the time Michael's had started selling take-out boxes in their gift wrapping section and I was inspired! I made three boxes each containing fortune cookie cards that had questions to use after reading at the non-fiction work station. I've had these in my room for several years, but I didn't photograph them because they weren't very pretty and had become faded from sitting in the window for years. I finally made a brand new set, fixed it up, and updated the questions. 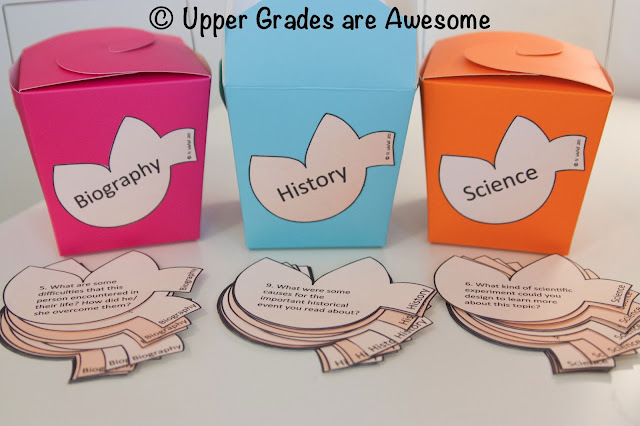 These cards are great because they add interest to students and they come in their own cute storage boxes! And these are not just for literacy work stations! 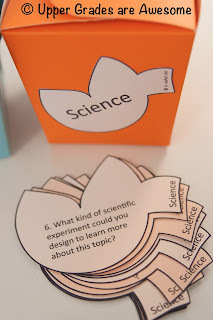 They can be used with small groups and whole class! 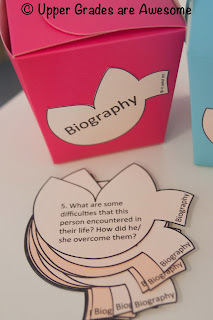 I just added the file to TpT, it includes 16 science fortune cookie questions, 16 history fortune cookie questions, and 16 biography questions. There is a label for each of the three genres as well. The file has a black and white version for printing on tan card stock, or a colored version to use on white card stock. The take-out boxes can be found at many craft supply stores (Michael's, Joann Fabrics, Hobby Lobby, etc.) These I purchased from Hobby Lobby for about $5.00. I *think* there were 8 included. I've even seen these at Dollar Tree! The pictured ones aren't laminated, but my original ones were. Just unhook the metal handles, unfold, and run through the laminating machine! So, I've been wanting to do a giveaway for sometime, but I'm nervous. I've never had one before and I don't want to do it wrong! Please gently let me know if I am committing a giveaway crime, I don't intend to! Runner Up - Two lucky people will receive a free PDF of the Fortune Cookie Question Cards for Non-fiction! Plus one free item of choice from my TpT store! * Fill out the simple 3 question form below. * Like Upper Grades are Awesome on Facebook and leave a comment finishing the phrase "Upper grades are awesome because...". * Follow the blog and comment on this post with the following: name, email address, and finish the phrase "Upper grades are awesome because...". 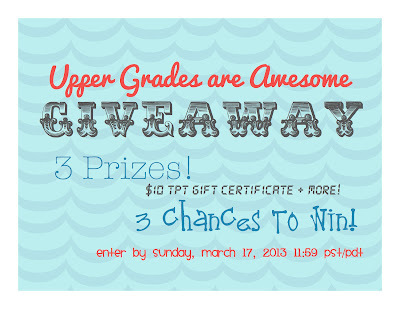 All entries must be received by Sunday, March 17, 2013 11:59 PST/PDT. Winner will be chosen using a random generator. I will announce the winners on Monday, March 18. Upper grades are awesome because students are too old to call you "teacher" but too young to call you bad names! I follow your blog. Upper grades are awesome because they can work independently and can stay on task without constant reinforcement/redirection. Upper grades are awesome because they are learning challenging things and sometimes I have to really think to meet their challenge to me! Upper grades are awesome because they can tie their own shoes! FREEBIE! 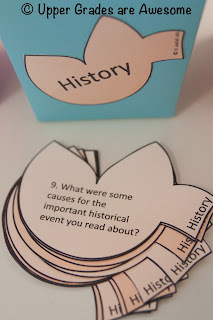 Wonderopolis Trifold Activity Sheet! Share a Healthy Snack Week SUCCESS!